Have you heard? TODAY May 21, 2011 marks the end of the world as we know it! But I, for one, feel fine. That's because, as these examples show, we've heard it all (and more) before, and all such prophecies so far have passed without incident...at least, since that whole dinosaur extinction thing. • Ronald Reagan (who it turns out is the Antichrist, since each of his three names has six letters) would, despite being out of power for two years, return to rule the world -- aided by the Masons, UFOs and a supercomputer. • In 1996, Reagan would begin his reign of terror by casting New York City into the Lake of Fire. • But luckily, two short years later, Jesus would return to Earth, triggering the Rapture (the faithless need not apply) and tossing satanic Reagan into the fire for 1,000 years. Blevins apparently had little to say after his predictions failed to come to fruition, no doubt preferring to comfort himself with the stacks of money bilked from people gullible enough to buy his book. • An unknown planet-sized object will suddenly come in close proximity with Earth, destroying our planet's magnetic field. • An inconveniently timed period of unusually high solar flare activity will cause lethal flares to strike the Earth's surface, triggering tsunamis, earthquakes, volcanoes, global warming, hurricane-level winds and a very smug Ed Dames. • Amidst the chaos but unrelated to the killshot, the Earth will coincidentally decide to shift on its axis, wiping out what life is left on the planet after the solar flares hit. • But have no fear: a humanoid alien race will show up after the devastation (thanks a lot) and help the few remaining survivors rebuild. In the meantime, they've left crop circles as indicators of the best places to be when the end of times occurs. Rural Kansas, here we come! Dames first predicted that the killshot would occur in the spring of 1999, and he and his employees spent a few days inside a lava tube in Hawaii waiting for the big event. Aw-kward. Undeterred, he has since continued to push out the date to "right around the corner" -- most recently somewhere between 2012 and 2014. • Nuclear war would ravage the Earth in 1999, but like He had done five times before since the age of the dinosaurs, God would arrive in a flying saucer and save a select few beings -- i.e., members of God's Salvation Church. Chen pinpointed the landing spot to be Lake Street Beach in Miller, Indiana. 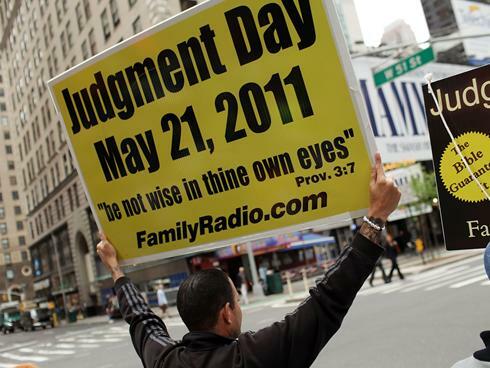 • But before all of that, at midnight on March 25, 1998, God would appear on Channel 18 on every television set in the US (sorry, rest of the world) to warn us about the impending global crisis. • God would look exactly like Chen. • Chen claimed to have amongst his followers a reincarnation of Jesus Christ ("Jesus of the East") and prophesized that linking him up with a "Jesus of the West" would save lives in the impending war. The other Jesus was supposedly a six-foot-tall 28-year-old man living in Vancouver, British Columbia who looked like Abraham Lincoln. The group placed a personals ad in local newspapers, but no one came forward. As nutty as they were to follow Chen in the first place, his followers were smart enough to see the writing on the wall after several botched prophecies. Most abandoned God's Salvation Church even before the predicted doomsday. • A planet-sized object, dubbed Planet X, about four times the size of Earth would sweep through our solar system, causing the Earth to stop spinning for six days. • The Earth's poles would shift, causing the crust to move and leading to all sorts of nasty weather -- winds, tidal waves, lightning, whirlpools and enough humidity for a billion bad hair days. • About 90% of the Earth's population would die, and their souls would be reincarnated as various entities, based on how selfless they are -- ranging from Earth-bound humans (the most selfless) to lesser beings flung off onto other planets (the most selfish). If you haven't decided whether to be selfless or selfish, you would be reincarnated as an octopus. Seriously. • She knows this because she's been communicating with aliens ("Zetas") since she was a child, having been implanted with Zetan genetic material that gives her telepathic abilities. Or so they tell her. When the date came and went with no cataclysm, Lieder and her followers stated that the 2003 date was a "white lie" and that "no date would be given as it would allow the establishment to mistreat the populace." The Man has to ruin everything. • The Battle of Armageddon would occur in the mid-1980s, during which the USSR would defeat a tag team of the United States and Israel. • In 1986, a Communist leader would emerge from Egypt and become dictator of the world, but around three years later, he would announce that he is in fact Satan (Surprise!) and would demand worship from everyone. • But have no fear; Jesus Christ would return in 1993 to conquer the Antichrist. The saved individuals would Rapture on up the road to Heaven, while Jesus would rule over the Earth for 1,000 years, with the assistance of Children of God members -- though you'd imagine all of them would be in Heaven at that point. If accusations of Berg's rampant child molestation didn't frighten his followers away, I supposed a few failed prophecies wouldn't seem like such a big deal. As such, although Berg died in 1994, his group continues to function under the name The Family International, with membership reported to be over 10,000. • The planets in the solar system would suddenly align into a "Grand Cross" configuration. • This movement would cause the Earth's poles to shift by 90 degrees, leading to a worldwide flood known as the "Water Baptism." • Survivors would form a worldwide society -- the "Kingdom of God" -- using a form of socialism dubbed "Eileenism." Jerusalem would be the capital of Earth, and Earth would the capital of the solar system. • Humans would have life spans of over 1,000 years and would swear loyalty to aliens and their almighty supercomputer, seeing as how humans were created by aliens. Duh. Although the events didn't unfold quite as expected in 1999, Lakes continues to tell her follower(s) to prepare for the "Kingdom of God," which now will occur around 2070, by which time she should be dead enough to avoid scrutiny when nothing happens. Most meteorologists today are satisfied with getting the weekend forecast correct, but back in 1919, respected meteorologist Albert Porta went beyond the call of duty and predicted that December 17 of that year would arrive with a 100% chance of your face melting off. That is, the alignment of six planets would create a magnetic charge that would cause the sun to explode and engulf the Earth. When doomsday came and went without so much as a severe sunburn, Porta lost all his credibility and ended up writing the weather column for a local newspaper. • Between March of 1995 and December of 1996, Earth would enter the Photon Belt, an immense ring of light particles (whose presence scientists have somehow not yet managed to recognize), that will transport the entire solar system close to the Sirius star system. • The Photon Belt would elevate humans into a higher state of being, from the third dimension, skipping 4-D altogether and going all the way to 5-D: a semi-ethereal shared consciousness between all humans. • Before the Photon Belt arrives, alien "counselors" from the Galactic Federation of Light would land on Earth to help prepare us for our new consciousness, teaching us not only how to speak telepathically with other people, but also with the dead and with plants and animals. When 1996 came and went without incident, Nidle proclaimed that the rituals and meditations of his followers "greatly assisted the local Spiritual Hierarchy in changing both the timing and the intensity of the Earth Changes." Well played, crazy person, well played.